We have all been there. Our kid is throwing a tantrum, they are screaming at the top of their lungs, they are telling us no. They do not want to cooperate, they do not want to listen. They have made up their mind, so now what do you do? You feel defeated, you feel angry, and you feel embarrassed. All of these emotions and more are completely normal. Both the parent and the child are in the midst of an emotional battle, mostly amongst their own emotions. Mom is warring with her inner mom, and child is warring with their own emotions. It’s a very difficult situation. It can be made infinitely worse by being somewhere public. It is human nature to want to appear like we all have it together. Well, guess what, we don’t, and that’s ok. Everyone may be watching and judging, but guess what? I can guarantee they have all been there, and if they haven’t they are lying. So what do we do when we are at our wit’s end. Honestly, there is no cure-all. Kids have tantrums, parents argue with them during tantrums, parents get upset, kids get upset. But does the world end? Nope. Child development experts tell us that children have tantrums because they cannot control their emotions or rule their world quite yet. Which makes sense, if you couldn’t make yourself calm down, and you were in a situation in which you felt helpless you would freak out too. Keeping this in mind there are some ways to make it easier to help your child help themselves doing a tantrum. Connect with them. Sometimes when a child misbehaves they are really looking for a physical connection. Giving them that connection can help ground their emotions and lets them know its ok to feel the way they do. A simple way to gain a physical connection every day is a hug. Choices!! This is a toddler’s bread and butter. Choices help them feel like they have some control over their life. So give them two or three options that work in the moment that you approve of. They still end up doing what you want, but by their own choice. This entry was posted in Health, Learning and tagged Behavior, children, Health, learning, parenting, parents, tantrum, the boys store, toddlers on May 21, 2016 by Lacy. Understanding Toddler Tantrums: Are We Making it Worse? Toddler behavior can be difficult. Tantrums and bossiness is usually a daily occurrence, even if you have the worlds best behaved toddler. Toddler tantrums may be few and far between but there are always a few. But what if some of the behaviors they are exhibiting are partially our fault? I must admit I have a really easy 3 year old that doesn’t usually throw tantrums, is fairly good at sharing, and doesn’t usually argue. But I have begun to take that easy-going nature for granted now that I am expecting another baby. The 3 year old is so helpful around the house, let’s mommy nap, and doesn’t usually argue that I have begun to leave her on her own more often to pay while I work, nap, or prepare for the baby. She loves to help prepare for the baby, and we do a lot of that together including painting the room, the furniture, folding the washed baby clothes, and cleaning her old baby toys. She tells me they are for her new baby brother since she is too big for them and has bigger toys that are just for her, but that she will share when he is ready. So I thought I was in the clear. Nothing to worry about wit orneriness, acting out, or jealousy. But recently she has begun to tell me no much more often, is trying to do things even though I tell he repeatedly she cannot do that, and recently shoved something up her nose leading to a 3 hour emergency room trip on a Saturday morning. I don’t think it has to do with a new baby, but I do think it I something I am doing. I think I stopped giving her the attention she needs, I stopped carving out part of my day to be with just her for her. Give my toddler more undivided attention. Even if it is just spending an extra 15-20 minutes alone with her everyday. Playing a game, coloring, or playing pretend. It’s such a small amount of time to me, but with her shirt attention span it really seems like a large portion of her day to her. Not anticipating their needs. I get hungry. When I don’t eat on time I get angry. So it should surprise me that when my toddler’s blood sugar is low she is grumpy. I need to make sure she has adequate snacks throughout the day. She also needs to burn some energy. Some time outside is a big help. Burn that energy 15-20 minutes at a time. Once again they have short attention spans and it gets hot outside so short periods are usually all they are up for, but it works wonders. Rest!! Unfortunately my 3 year old gave up naps a while ago. But she still needs rest throughout the day. So instituting an afternoon quiet hour is perfect. No videos, no movies, no games. Books are ok but anything with too much stimulation like pretend lay or quite toys will still provide her with too much. Think quiet coloring, quiet reading, and maybe some cuddles on the couch. High expectations. They are very young, and they don’t always have the ability to be quiet for long periods of time, sit still for long periods of time, and they can’t always be expected to behave wonderfully all of the time. If they seem to be breaking a particular rule over and over consider that it might be something they just aren’t capable of doing yet. Try making the rule simpler, or be more lenient. I cannot expect my 3 year old to be perfectly quiet for more than an hour while I rest. But if o set up some quieter activities for her during this time I can usually get a little rest in. Remember toddlers are toddlers and they will have bad days, we all do . But maybe next time they throw that totally terrible tantrum take a minute to look at why, it might help both of you have a better day. This entry was posted in Health, Learning and tagged Behavior, Health, healthy children, tantrums, the boys store, toddler learning, toddler tantrums, toddlers on August 10, 2015 by Lacy. We have been trying to teach our two year old the alphabet. We sing the song everyday, but we also want to teach letter recognition. Since there seems to be a train obsession in our house at the moment we thought we would use that to our advantage by creating an alphabet train. We drew a train engine and 13 box cars. Each car has two letters at the bottom. We also cut two wheels for each car. Each wheel has a letter that matches the ones on the box car. Our two year old then sits with the wheels and must match each letter wheel to its corresponding letter on the box car. It has been working like a charm. Each week we focus on two letters. Here is a photo of our first week, A and B. We have been matching them with some curriculum sheets here at the house that allow for letter tracing and letter finding. One sheet features the letter, capital and lowercase, and allows for the child to practice tracing the letter. We covered the page in a plastic sheet so that they can trace over and over and erase multiple times. We did e same thing with a sheet that has multiple, and random, letters on a page. They must find the letter of the week and circle them. This may sound difficult but it actually works pretty well. The circles aren’t always perfect, sometimes they are just covered in scribbles, but they are recognizing the correct letters and marking them. We are excited to see progress already. Last week we were at the store and our two year old recognized the letter A on a sign. We were so proud everyone did a little dance in huge middle of the grocery store! Is your preschooler or toddler learning their alphabet? Do you have other ways of teaching the alphabet? 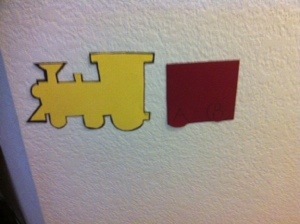 We would love to see your methods and hear whether you are going to try the alphabet train. This entry was posted in Activities, Learning, reading and tagged Activities, alphabet, alphabet train, learning, preschool, the boys store, toddlers on July 4, 2014 by Lacy.